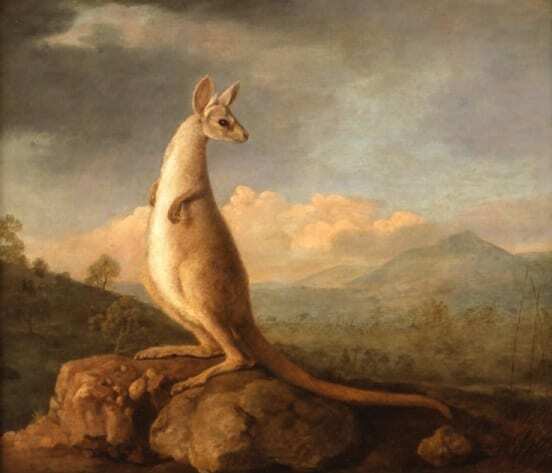 The painting of the kangaroo by George Stubbs would never have existed if it weren’t for an extraordinary bit of bad luck in a very dangerous situation. Famously, Captain Cook aboard the Endeavour confirmed the existence of Australia in 1770. Cook first caught sight of the continent on 19th April. He sailed north, unable to find anywhere safe to land for nine days. When they did on 28th April, Joseph Banks, the great naturalist aboard spent two weeks collecting plants in the area which they would name Botany Bay, but sailing north along the east coast they made only two other brief trips on land over the subsequent few weeks (for water, unsuccessfully). By this time they had only recorded seeing one Australian mammal (probably a bandicoot) – the voyage was very nearly a zoological disappointment. Despite the lack of water, they had been incredibly lucky; having unknowing sailed over the treacherous shoals of the Great Barrier Reef for weeks. That luck would run out on the night of 11th June 1770 as they ran aground on the sharp coral, tearing holes in the Endeavour’s hull. The site, Cape Tribulation, is where I found myself last month, and I decided to make a Cook-based pilgrimage. Please read the rest of this post here on the Travellers’ Tails blog. *Acquired with the assistance of Heritage Lottery Fund; Eyal Ofer Family Foundation; The Monument Trust; The Art Fund (with a contribution from the Wolfson Foundation); The Crosthwaite Bequest; The Sackler Trust; Sir Harry Djanogly CBE; The Hartnett Conservation Trust; Sheila Richardson and Anthony Nixon; The Leathersellers’ Company; Gapper Charitable Trust; Genevieve Muinzer and others.